To say that Japan is my favorite destination would be a major understatement. I’m writing this post while taking a break from packing my bags for my seventh trip to the Land of the Rising Sun. Let that sink in. This is my seventh trip in a span of 4 years. That’s two trips a year. My first Japan visa allowed only single entry, as expected. The second time I applied, I was expecting another single-entry visa, but I was provided a multiple one, valid for three years. I didn’t do anything. The itinerary I submitted clearly called for a one-time entry and I didn’t have that much money in the bank at the time, but they gave me multiple. When it expired earlier this year, I thought I would be given another multiple. But when I applied for the third time, to my surprise and dismay, I was given a SINGLE-ENTRY visa. It was so puzzling. I have a theory, which I will explain later. The fourth Japan visa I got, the one I received just last week, was MULTIPLE-ENTRY, valid for five years! Woohoo! I also took care of the visas of my mom, niece, and nephew, when we went on a family trip last year. 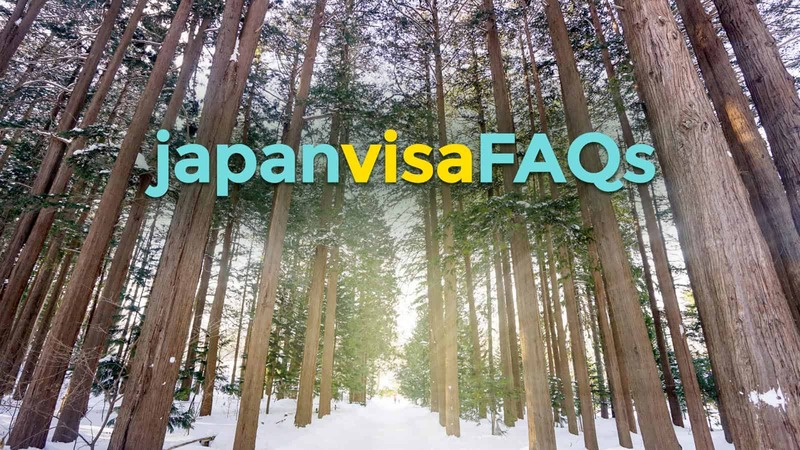 So here are the questions we usually get from our readers who are planning on lodging a Japan visa application, together with our answers. 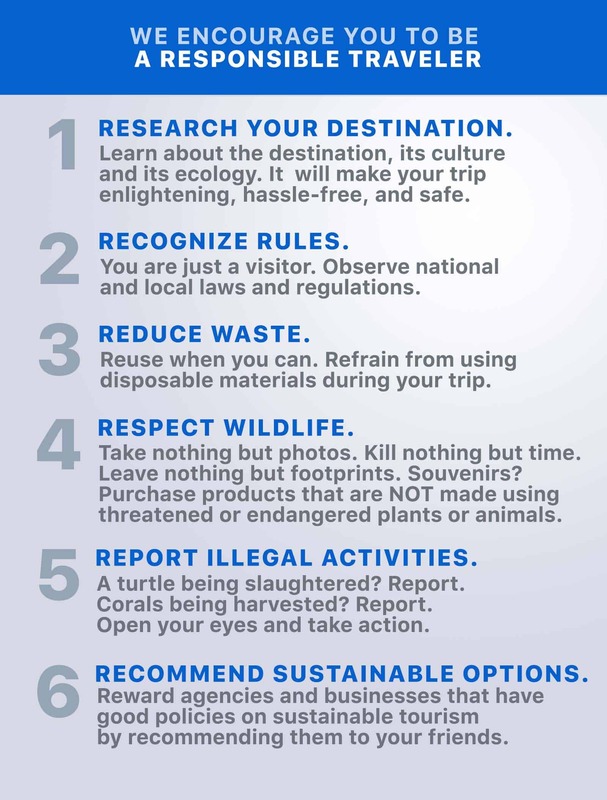 Oh before I forget: This post is for tourists holding a Philippine passport, applying in Manila. Rules may be different in other cities and for other nationalities. Am I eligible for a multiple-entry visa? How to apply for a multiple-entry visa? What are the requirements? Are non-first-timers granted multiple-entry visas automatically? 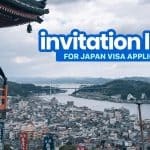 What does Japan visa look like? Do I need to reserve hotels before applying? 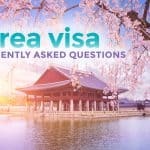 How long can I stay in Japan if I am granted a visa? I’m a freelancer so I don’t have a Certificate of Employment. What can I submit? Can I submit a birth certificate issued more than a year ago? What is the address of the Japan Embassy in Manila? How will I know if my visa application is rejected? Will I know the reason for the denial? I was previously issued a single-entry Japan visa and I used it already. How soon can I apply again? They don’t call it “renewal.” It’s more like applying for a new visa, to be honest. The process is still the same. The only difference is, you don’t need to submit a birth certificate this time. You also have to submit a copy of your previous visas. Philippine passport. Must be valid for another 6 months or more. Must have a signature and at least 2 blank pages. Accomplished visa application form. Don’t leave any fields blank. Just put N/A if not applicable. Download here. ID photo. 4.5cm x 4.5 cm. Write your name and birthdate on the back side. Paste it on the application form. Copy of previous Japan visas. Original (on the passport) and photocopy on A4 paper. Daily itinerary or schedule in Japan. Printed on A4 paper. Download the format here. IF APPLYING AS A GROUP/FAMILY: Accomplished list of Visa Applicants. Only if traveling as family or group. Printed on A4 paper. You can download the form here. – Income tax return (ITR Form 2316). Clear photocopy. – Bank certificate. Must be issued within the past 3 months.  – Certificate of Employment. Not a requirement but strongly recommended. – Guarantee Letter. Must explain your guarantor’s relationship to you and their contact details. – Proof of relationship between applicant and guarantor. For example, if the guarantor is a parent or a close relative, submit their birth certificate too. – Bank Certificate of the Guarantor. Original copy. – Income Tax Return (ITR Form 2316) of the Guarantor. Photocopy. 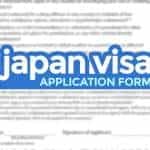 We have a more detailed list of requirements and step-by-step guide here: JAPAN TOURIST VISA REQUIREMENTS. Just remove the birth certificate and marriage certificate and add a copy of previous visas to the list, and it’s basically the same set of requirements and process. If you’re applying to VISIT FRIENDS / RELATIVES, you can find the list of requirements here: JAPAN VISIT VISA REQUIREMENTS. However, please note that if you’re visiting a close relative, you might still need to submit a birth certificate and/or marriage certificate to prove your relationship. Gather all the required documents. You’ll find the list above or in our dedicated posts. Choose an accredited travel agency. All tourist and visitor visa applications must be coursed through any of the agencies designated by the Japanese Embassy. See the list of agencies here. Submit the requirements. Every agency has their own sets of rules when processing applications. Some require personal appearance, some don’t. Some have limits on how soon the trip is, some don’t. The officer hours also vary. Call your chosen agency beforehand. Pay the Processing Fee. Technically, the visa is FREE, but the agency charges a service fee or processing fee. The rate is different from agency to agency but it’s usually around P800 – P1600 for tourist visa, and P1200 – P2500 for visitor visa. Claim your passport. Processing normally takes 3-5 days, but there are instances wherein it takes a lot longer, sometimes weeks. Thus, make sure you apply weeks before your trip. Depending on your arrangement with the agency, your passport with the visa (if approved) either will be mailed to you or must be claimed at their office. If your passport has a Japan visa, it means your application has been approved. If you can’t find a visa, it means your application is denied. If you meet any of the requirements below, yes. 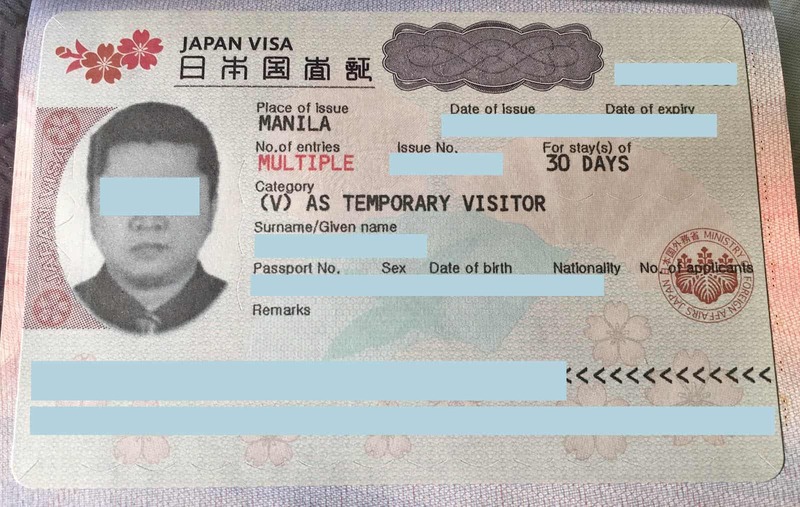 A person who has travelled to Japan as temporary visitor within the last three years AND has sufficient financial capability to support their trip. A person who has travelled to Japan as temporary visitor within the last three years AND has travelled as temporary visitor to G7 countries (excluding Japan) several times within the last three years. The other G7 countries are: Canada, France, Germany, Italy, the United Kingdom (UK) and the United States (USA). A person who has high financial capacity (but has not been to Japan in the past 3 years). The keywords here are HIGH FINANCIAL CAPACITY. Immediate family member (Spouse/Child) of a person who has high financial capacity. It’s true that the Embassy sometimes grant MULTIPLE-ENTRY visas to returning tourists even when they’re not asking for it. It happened to me twice. But it doesn’t mean it happens to everyone every time. 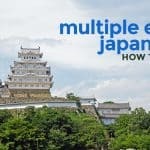 If you look at my Japan visa history at the beginning of this post, you’ll find that I was given a SINGLE-ENTRY visa after my THIRD application, even after having been granted a MULTIPLE-ENTRY visa before. It’s unpredictable because they’re basing it on many factors. It’s still at the sole discretion of the Embassy. Yes. Unless it’s a special case, all visa applications must be coursed through any of their accredited travel agencies. No. It’s not a requirement. However, on the application form, you will have to write down the specific AIRLINE or SHIP you wish to take. If you don’t have much funds in the bank, write a low-cost carrier like JetStar or Cebu Pacific Air. No. But again, you should have an idea where you plan on staying because you will need to write it down on the application form. Make sure you have the name of the hotel, the address, and the phone number. You don’t need to book yet. Just pick a hotel. Again, if your bank account doesn’t have much, choose a budget hotel or hostel. Don’t write down the name of a luxury hotel if you have less than P100,000 in your bank and you’re staying for 15 days. Make sure you can afford it because it matters! No. If your application is approved, you can stay anywhere. 7 working days, according to travel agencies. But it varies. My first time, 5 working days. Second time, 2 days. Third time, 7 days. Fourth time, 2 days. A friend of mine waited for 3 weeks. Multiple-entry: 15 or 30 days. Note that validity is different from length of stay. Validity period usually refers to the period in which you can use the visa. Length of stay is how many days you can stay once in Japan. For example, usually, a single-entry visa is valid for 90 days, allowing no longer than 15 days of stay. This means that if your visa is issues in January 1, you can travel to Japan any time until March, but once you’re in Japan, you can only stay for up to 15 days. The Embassy doesn’t explicitly say how much money you should have in the bank. The amount isn’t the only factor. It’s probably on a case-by-case basis. I have applied for a 15-day stay with only P100,000+ in the bank and my application got approved. A friend of mine applied for a 5-day stay with only P50,000 and got approved. She has a full-time job. Another friend applied for a 5-day stay with over P200,000 and got denied. She doesn’t have a regular job. I think the rule of thumb is: how much savings you have should be proportional to how long your stay is. 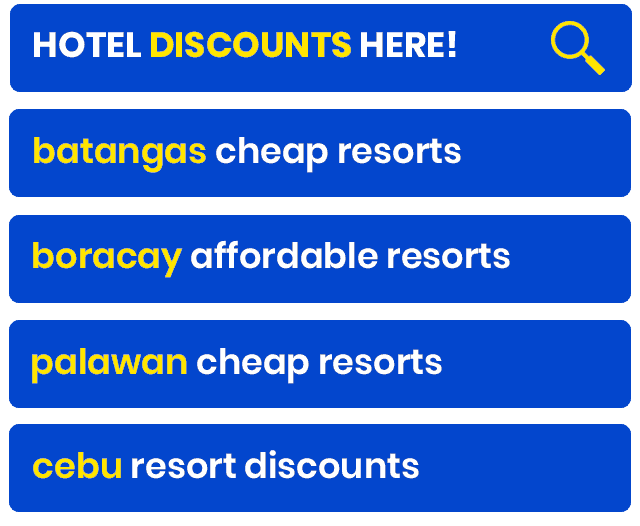 For example, if you have only P50,000, don’t apply for a 15-day stay because that would obviously raise a lot of questions regarding whether or not you can afford the trip. Also, I think the Embassy is more concerned about whether or not you have a compelling reason to return to the Philippines, which is why they scrutinize your employment status and travel history. The Certificate of Employment is no longer a requirement, although it is always a good idea to submit one. If you’re a freelancer, here’s what you can do. Get a letter from your clients that could serve as certification that you’re working for them. Make sure that the letter mentions what you do for the company, how much you’re earning, and how long you have been working for them. I have tried it before. The agency accepted it. The embassy approved my application. Write a letter explaining why you can’t produce an ITR and submit more proof that you have a stable source of income (invoices, payslips, other tax documents, etc). You can also declare that someone else will be paying for your trip, whom they call a “sponsor.” If you choose to do this, you will need to submit the ITR, COE or business registration documents, and bank certificate of the sponsor. I haven’t done this personally because I always have an ITR even during the time I was a freelancer, but I know people who have done this and were granted a visa. UPDATE: Okay, I was able to try applying without an ITR during my last visa application. I wrote a letter explaining that I wouldn’t be able to submit my latest ITR because I recently shifted to becoming an entrepreneur and I won’t have a copy of my ITR until the end of the year. I then added that I’m submitting a copy of my ITR for the previous year together with COE from my clients and my business registration docs. You can, but it’s too close. There’s no assurance you will have your passport with or without visa in time. It is always good practice to apply at least a month before your travel date so you have time in case they ask for additional documents. Some travel agencies like Reli Tours also have a policy of refusing applicants whose travel dates are set sooner than 7 working days from the date of application. Happened to my cousin. It depends on a lot of things: which travel agency you’re applying at, how you’re applying, and what your background is. For example, based on my experience, Reli Tours and Friendship Tours require personal appearance for walk-in applicants. I have tried applying for my cousin at Reli Tours SM Megamall and they won’t accept the application. Our accountant also tried applying for my mom at Friendship Tours at Dusit Thani Makati but she was told that my mom had to be there in person. She was also told that we could just mail the application instead if personal appearance was impossible. However, on a separate occasion, my cousin was allowed to apply for my niece (a minor) at Reli Tours Southmall even when the kid wasn’t with her. It might be because of two things: because my niece was a minor and because they were traveling together (group). I’m not sure if it’s the same for all travel agencies or for all branches. IF some of them allow it, make sure you have a signed authorization letter, ID of the applicant, ID of the representative, and proof of your relationship with them. Best to just call your chosen travel agency to be sure. NO. The birth certificate MUST be issued within the past year. You cannot fake your way around it. The issue date is printed at the bottom of the birth certificate so both the agency and the embassy can easily figure out how old your copy is. Technically, FREE. But the travel agency collects a processing fee, usually playing between P800 to P1800 depending on the visa type. Your passport will be returned to you. If there is no visa affixed to any of the pages, your application has been denied. No, they will not provide a reason or any sort of explanation. Yes, but you have to wait 6 months before you can apply again. Anytime. There is no time frame required if you’ve already used your visa. You can apply again as soon as you want. I’ve done that between my 3rd and 4th visa. I used my visa in February, but I needed to be back in March. I applied again, no problem. Hi, my passport’s about to expire within the next few months. I was wondering if the multiple-entry visa in my expiring passport can be transferred to the new passport? Will that visa still be valid or do I have to apply for a new one? Hi. My case is the same, valid ME visa in an expired passport, with newly acquired one. Does the Philippine immigration know about this rule pertaining to exit from the Philippines for entry to Japan? What was your experience? Thanks in advance. Hi, yep! I asked the staff at DFA myself and I had been using my ME visa on an old passport for 3 years (over 5 trips to Japan) and never had any issue with Philippine or Japan Immigration. Hi! Can I apply for a single-entry visa months before my trip (say 6 months before)? Or it has to be closer to the date of the trip? Thanks. Not the OP but the validity of a SE visa is 3 months. That’s why agencies recommend applying for visa 1-3 months before your trip. HI. Im planning to apply for japan visa but i have no work so i cant produce ITR or payslip but my aunt will provide my ticket and my stay in japan even my bank, my aunt will deposit enough amount to my bank for bank certificate puposes. But still i am in doubt if i will be granted of japan visa. Do you think i will be granted? Hoping for your response. Thank you. By the way, im planning to apply via Reli Tours and Travel agency. I think you may have your aunt as your guarantor. Overall, I don’t recommend to have your application at Reli unless you had your previous visa application approved by that agency. If you will still apply there and did not allow you to have all your documents processed, don’t continue and had your application processed through an another accredited Japanese embassy authorized travel agency. Just search Reli on facebook and you decide if you will continue there. I just tell this based on my experience. Hi! May I know what is it about Reli? I processed my visa application (without guarantor) there last April and got approved. I’m planning to go back to Japan next year and have my application processed by them. Just curious! Mabilis and mura processing ng visa sa kanila. Reli din ang go-to agency namin when it comes to Japan Visa application. Hi! I have a full time job but I am earning minimum salary. I have money in the bank and I do have travel history from non-visa countries in the past years. What are the chance that my visa will get approved? Hello! I have a full time job but I am earning minimum salary. I have money in the bank and I do have travel history from non-visa countries in the past years. What are the chance that my visa will get approved? Since you have been to Japan 4x already, I think it should be better if you submitted an appeal letter through the agency where you had your first application approved or to another agency except the one you had last submitted your requirements. We also appealed when there’s a problem with the agency not accepting alll our documents. Luckily, Japan embassy aprroved our application when we submitted an appeal letter and documents through the another agency. Also, try to call the Japan embassy and state your probblem. Thanks for sharing about Japan visa and I should have read it before applying for a Japan tourist visa. We were denied on our first application but able to reaply again with an appeal letter and be approved in less than a month because we had a problem with the agency who processed our first appliation. Good thing that we were approved after that. To those who were denied visa, don’t feel devastated, just try again or if have to leave asap and submit additional documents, try to submit an appeal letter. You may also search on “how to apply a Japan denied tourist visa in less than a month” and scroll within the first page of Google search. But if you don’t have a solid basis on why you must be approved immediately, just wait again for 6 months. Kakaresign ko lang sa prev company last Friday at magsisimula ako sa new company this week then ang Japan vacation ko will be on November 22 to 28, 2017. Magkakaissue ba if sa COE ko ay magrereflect na bago palang ako sa company? Or better na isubmit ko na lang ay ang ITR ko from prev company, COE na kakakuha ko lang last week at payslip ko from prev company then mag-aapply ako 1st week of September? Need your views on this matter. Thanks to this blog! I got my Japan Visa in just 2 days… Lodged my application on the 28th of August and got it the next day!  I applied via Reli Tours Southmall! Just wondering, what do you usually put as reason for multiple visa request? need ng bank certificate, not bank statement. Hello. I will be applying for a japan visa this week. I quit my job last year so I thought my brother would sponsor me. But I am not sure which form to submit? Is it the guarantee letter? even though my brother is Filipino and living in the Philippines? (I’m not quite sure cause I’m kinda thinking the guarantee letter is for guarantors who lives in Japan?) I hope you’d be able to help me on this information. Thanks! Hi Nonon! Having a Pinoy guarantor is okay. You will need a guarantee letter and proof of your relationship. In this case, you will need to also submit a copy of your brother’s birth certificate. Hi, my boyfriend’s Japan visa was approved for 90 days with a single entry and will expire on January 2018. My concern is, Does it mean he needs to get a flight immediately and needs to go back in the Philippines before January 2018, or the 90-day duration of stay in Japan will start in the 1st day of his departure there? He has to enter Japan before January 2018. Then the 90-day count will start on the day he arrives in Japan. Oops, What I mean is does the 90-day duration of stay in Japan will start in the 1st day of his arrival there? Thank you. hi if we will be staying in 2 hotels, (Tokyo & in Kyoto), do we need to include the name and address of both hotels? if we will be passing those 2 hotel reservations for my application…Thanks. If the itinerary you will submit indicates you will be visiting both Tokyo and Kyoto, you have to include both hotels. Hello! May I know how will I add another hotel on the application form? The spaces provided for are not enough. Can you plese show me how? Thanks! You can write just one in the form and include the rest in the Daily Schedule. Hi! We have booked an AirBnB for a Japan trip in December (it’s a residential address) and plan to submit our documents sometime this month. Given that the AirBnB owner is not someone we know personally, would it affect our application if we placed the AirBnB’s address as our accommodation? Or can we just place the name of a hostel near the area? Hi Adette, if you apply as a tourist (and not as someone visiting a friend) I don’t think it would be a problem. Just also indicate AirBnB so it’s clear to whoever will process. Hi question. When i renewed my passport i didnt change my surname or marital status. Now im going to apply for a Jap visa and i realized that all of my requirements (bank cert, bus permit, itr) are all using my married name. Is that going to post a problem or is a marriage certificate gonna suffice? Your marriage certificate should be enough, but it would be best to call the agency to double check. I applied for Tourist Japan Visa last week and got approved 10 days later (applied in Cebu). Just wanna share with you how I was able to get a visa with just 50k in the bank. 1. I would recommend that the form be filled out online instead of handwritten, because it’s clear and no erasure. There shouldn’t be any blank spaces left, put N/A if ever. Cross check all the details inputted and make sure it coincide with your itineraries. 2. Your Japan daily schedule should just be simple and easy to be determine by the Embassy. 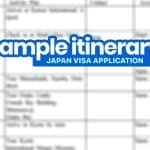 Too much or complicated itinerary will give you less chances of Japan visa. 3. Honestly, I only have 50k in my bank but I was confident it wouldn’t be an issue as long as you have travel history like South Korea or any other Asian countries. 4. I added my plane tickets and accommodation confirmation which i booked from Agoda (Pay later). I highly suggest to book your accommodation through Agoda since they have pay later feature. To sum up, as long as you comply with the requirements, there’s shouldn’t be an issue. How long was the period of stay you applied for? which agency po ba kayo? Hello po. I’m just curious. Valid pa ba yung passport ko if nabasa sya? Yung upper part nya yung nabasa and very minimal lang. Pero yung photo and laminated part is okay. Walang stain. Hoping na Sana matulungan mo ko. Thank you po! Hello, I’m just curious about the validity of my passport. The upper part got wet but the laminated part or my bio data and photo are okay. Water stain is very minimal. Only the last few pages got water stain. Is it still okay if i apply for tourist visa? Hope you can help me. Thank you sir. 1. Is it okay to put a home address even though we will not state that we are invited? 2. I am a free lancer, I have ITR but no COE, I only submit my ITR (quarterly) online. Will that be acceptable? My husband is employed and he can provide everything, I compared mine and his, mine looks unofficial (just printed out on my own), would that be a problem? 3. We don’t maintain a huge amount of money in a bank, I have two though, (not really a fan, especially with BPI glitches last time), would it be okay to have a low history daily balance less than 30k? I’m planning to apply on January, can I still work it out? How much should I keep? We are planning to stay for only 4-5 days suburb area. Thank you so much, would really appreciate your reply. If you want to be on the safe side, better to put a hotel and hotel address. Have you considered having your husband as guarantor instead? old/valid passports with used Japan visa. 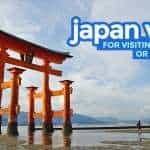 Hello ask ko lang my mom stay here in japan as tourist visa inextend ko sya bale 6months po sya dto kelan ko po kaya sya uli pwd invite pabalik dto s japan as tourist visa. Thanks in adv. Hi Diana, I think it’s because the third visa was on a new passport. (I got a new passport between the 2nd and 3rd applications.) And although I submitted the old passport, I don’t think they looked at it. But when I applied for the 4th time, I was given multiple since there’s already a Japan visa on the new passport. Same thing happened to my blogging partner Vins. His 3rd visa was on a new passport and he was issued a single-entry visa again, despite being granted multiple before. Can multiple Japanese Visa’s be transferred to a new passport? I have been granted multiple entry visa but my passport validity is due to expire within 2 years time. Hi what if the old passport (still in single status) where in the multiple visa is there and renewed already the passport with married status. It is still valid? Provided with marriage contract? Hi Aileen, not sure but as far as I know, yes the visa will remain valid even if your status and your passport have changed. Just make sure you bring a copy of your marriage contract when you travel. Hmmm. Medyo mahirap kasi requirement talaga nila ang COE and ITR. If kaya mo namang ijustify kung bakit ka unemployed now (transitioning to entrepreneurship, etc), baka pwede pero they might ask for additional supporting docs. Medyo irrelevant yung case ng bf mo kahit ilang beses na sya nakapunta kasi applications are processed individually. Hi,we will be applying for japan visa next week but our company hasn’t issued yet our itr for 2017.is it okay if i’ll just submit my 2016 itr?thank you. Hi question. When i renewed my passport i didnt change my surname or marital status. Now im going to apply for a Jap visa and i realized that all of my requirements (bank cert, bus permit, itr) are all using my married name. Is that going to post a problem? Not sure, but I think I remember I asked this question to the agency and they said that you just need to bring a copy of your marriage certificate. Good day! Thank you so much for this great article. I’m a Filipino who was born and raised in the Philippines. I’m planning to visit Japan on April 2 for 15 days. This is going to be my first time to apply. I work as a Virtual Assistant, Freelancer as of the moment. I have a Japanese friend living in Japan who will serve as my guarantor for this trip. Helo po.. Nagpaprint po ako kanina ung sa letter po for the consulate general in manila for my visa application..kukunin po kasi ako ng friend ko sa japan. Eh nung naprint ko na poh nagkamli po ako.. Ung sincerely nacover na po nung last stanza eh wala na poh akong extra copy.. Tatanggapin pa po kaya nila un? We will apply for a japan visa next week. I would like to ask if we can apply directly to the Japan Embassy? Or should we really need to go thru agencies? 2. Im employed to a private company, do i need to submit a Cert. Of Employment or ITR and company ID will be fine? Thank you. Not sure, but I think it wouldn’t matter. Just apply again. Hi…..According to the agency where i submitted my application you need to write an explanation for the unsed japan visa. Thank you for this article. It’s really helpful! But then, I just wanted to be enlightened with my case. I am a solo-traveler with no guarantor, I plan to book my own flight and hotel (pay later) since it might be cheaper than getting a tour package. I still haven’t process my VISA yet since I am not familiar on the places and what to include on my Daily Itinerary (they are asking for contact numbers). I don’t want to get my VISA denied. Would you suggest to avail a tour package as a first-time traveler? Thank you. No, you don’t need to avail of a tour package. You just need to plan your trip and make your itinerary. Hi Ruben, it’s not possible for us to give a percentage of the possibility kung maaapprove or hindi. It depends on many factors. But merong mga nag-aapply na first time magtravel abroad na approved ang application. For example ung length of stay na nilagay ko ay 6 days sa application of visa at wala pa talaga nabook na flight. tapos ung actual flight booking ko 8 days pala. ano po mangyayari? I have no idea how. But maybe some of our readers know. Hi! Ask lang po, my husband and i are planning to visit japan in oct 2018. Im currently employed and can provide all the needed requirements, but my husband on the other hand is a freelancer. He has No ITR and COE. Is it ok if we pass our application together, provide a NSO marriage certificate and we will provide a letter of explaination that i will sponsor both our expenses? Thank you and hoping for your feedback. Hi Sir! Ask ko lang. Yung balak ko ilagay sa itinerary ko is 4 days lsng pero ang nakuha ko talaga na flight is 8 days. The reason is para hindi ganun kalaki yung kailangan ko ipakita sa bank statement ko. Okay lang ba to? Hi po. Any idea po if ano yung process if ako yung mag shoulder ng expenses ng parents ko who are both in Pinas but im currently working overseas.. Pero I will join the trip with them. ITs jus thaT sa Pinas sila mag apply ng visa granted na mag susupport ako lahat ng docs like bank cert, sponsorship letter , etc.. is it possible kaya sir? Hi JB, yes, possible. Just provide the documents needed or equivalent nun sa country where you are. Example, instead of the ITR, submit ung version ng tax certificate sa bansa kung asan ka. If sa hotel ka magse-stay, better if tourist visa. If sa bahay nya, visit visa. What if I’m an online seller and don’t have ITR , COE or even payslips. Can’t provide a provide a proof of income, what documents should I submit? Thankyou! If you’re applying as a tourist, you can try writing a letter explaining why you can’t provide an ITR and submit other proof of income as an online seller. Of course, there is no guarantee that yours will be approved. Hi! My mom and I are planning to go to japan this October. My mom is a housewife and I am a graduating student this June so we can’t present any ITR, but my mom will be paying for the trip and had saved money for this. Reli tours said that we don’t have to provide a letter of explanation. Is this okay? Or should we make a letter saying that my mom is a housewife? My father is an OFW so he doesn’t have an ITR as well. Thank you so much, this blog is really helpful! Hi Jo, just follow what the agency recommends kasi for sure mas alam nila. Although yung experience ko, Reli Tours din, I provided a letter of explanation nung one time I applied na walang ITR. hi! planning trip on sept., we’re 3, meron na kami plane ticket for 10 days. If kukuha ng visa and guarantor yung mother ko sa amin 3 , anak ko tas si hubby, the thing is hindi kami kasal ni hubby, ano kaya pwede gawin? pwede ba by group application namin? need enlightenment. Hi, I was wondering. I’m planning to travel to Japan. Coincidentally, I now have a long time Fil-Jap friend (who grew up in the Philippines) now living in Tokyo. Would it be alright to put his address as my address when staying in Tokyo? He’s not a guarantor though. I’m not visiting him as my main purpose of travelling to Japan, that’s why I’m a little confused if it would be okay to use their address as where I’m staying. In theory, if you want better chances of approval, if you’re applying for a TOURIST visa, write down a hotel name. If you’re applying for a VISIT visa, fill it in with a person’s address. If you’re applying for a TOURIST visa and writing down someone’s address, it might raise some questions. I’m a bit confused po. Para saan po yung hotel reservation nyo? Visa application or Immigration? Sa visa application, hindi kailangan ng hotel reservation dun. Question po. We booked a 9 day trip to Japan already but we’re nervous since we’re not sure kung enough yung pera sa account namin. Can we put a lesser days of stay ba dun sa application form like 5 days para lang medyo sure pero magstay pa rin kami ng 9 days? Wala naman po kasi sa requirements yung flight details. Hi again.. itatanong ko na rin to.. pano kung visiting relatives visa ung iaapply ko.. pero ung guarantor ko is japanese boyfriend ng sister ko na nsa japan? Is it okay? Sya ang guarantor and sponsor ko..
1. Is it possible that we get a multiple-entry visa even by applying just a single-entry? 2. Would it matter if we include our flight itinerary which shows only 5 days of stay in Japan? 3. Is it okay to just put a name of a hotel even though we haven’t booked any? We are actually booked in AIRBNB but our host said that there has been an issue between Japan gov’t and AIRBNB, hence, we decided to just put a hotel name. 4. When you say, HIGHLY SUFFICIENT FINANCIAL CAPACITY, how high is this? :) Do you have an idea how much more or less should appear in the bank certificate? 5. Can you give feedback or reviews on Discovery Tours, if their chances of processing of APPROVED visa is high or not? Hi ANgel. First time mo ba magtatravel sa Japan? Kasi malaking factor un. 1. Yep, happened to me before. But according to Reli Tours, lately daw, if gusto ng multiple, kailangan nang i-apply talaga na multiple. But if you’re traveling to Japan for the first time, it’s highly unlikely na multiple ang ibibigay sayo. 2. Hindi sya kasama sa requirements. Sa ibang agency, tinatanggal din nila yan kahit isubmit mo. I dunno sa Discovery. 3. Yep, okay lang. Di kailangan na may nakareserve na. Kelangan lang nung name ng hotel, address and contact number. 4. I dunno. They don’t say exactly. Best to ask the agency. 5. Haven’t tried. No idea. I was just in Japan last month, around April 13-21, 2018 for the first time, I plan to immediately apply for a multiple visa. I want to visit again around in December or next year. I think I can provide around more or less Php 100k on my bank statement. Is it okay to apply right away after just being there? Or is it wise to wait a bit for a few months? Hi Reins, yep, it’s okay. I know that because one of my teammates was in Japan in December and then applied again in January for a multiple visa. The amount in her bank account is lower than yours. Her application was approved. That’s not to say yours will be approved too. Depende pa rin yan sa case mo and sa mag-aassess ng application. Wala namang guarantee. But I’m just sharing to show that it’s possible. Hello poh… How many days was your visiting relative visa in group application approved? Hello! I’m an independent contractor in my company, hence, they cannot issue a COE for me. Do you think the embassy will accept COIC (certificated of Independent Contractor)? Looking forward to your response. Thank you in advance! HI, my question is, my sister who is an american citizen is paying for my sons ticket and stay in the Japan. My son will be joining her family in a 4 day 3 night trip to Japan. How do I go about the guarantor requirements? BTW what does the SEAL mean in the letter of guarantee? thanks for your help in advance. The seal is for cases when the guarantor is a Japan resident. Residents in Japan have a seal that they can use for legal documents. Hi! 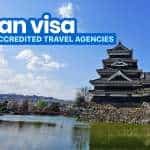 Gaano katagal yung gap ng first trip mo sa Japan sa 2nd time mo mag apply ng visa? My first visit to Japan was just last year (November) and I plan to go back later this year. August or September ako mag-a-apply ng visa. I hope the one year gap is good enough para may chance makakuha ng multiple entry. Hi Allan, I don’t think it matters. My teammate Astrid was just in Japan December last year, and then she applied again in January for a February trip, and she was given a multiple entry visa. Another question just to make sure…ok lang ba na hindi sundan yung itinerary na isusubmit especially the number of days of stay in Japan? Ideally, sundan. Pero okay lang na hindi, basta within the allowed period pa rin. Yes po. If ever na single entry ulit makuha ko, I will travel within the 3 months na valid ang visa. Ang worry ko lang is if example Nov 6-12 ang nasa submitted itinerary pero hanggang Nov 15 or 16 talaga. Ok lang ba yun? Last time kasi sinundan ko talaga yung date of arrival and departure ko. Oks lang yun basta within the validity period. Hi. Can a “temporary visitor” renew their passport in Japan? If yes, how long does it usually take? Thank you! Last week of september po ako magaapply for japan visa, flight namin is nov4- 11 2018 inaalala ko lang po if magagrant pa din po ba ako ng visa since expiration ng passport ko is april 15,2019. Inaalala ko po kase yung 6months before expiration ng passport..
Hi Princess, naku, di ko alam. Pero ang best na gawin mo is magrenew ka na ng passport before ka pa mag-apply ng visa para sigurado talaga. I have a question. pwede pa din po ba ko maka enter ng japan kahit po ang visa ko expired na the next day? ang flight ko po kasi ay July 19,2018 ang expired po ng visa ko ay July 20,2018. pwede po kaya yun? Hi what if my visa on old passport got stained by oil. Can i still use my japan visa there? Thank you for the very informative FAQs! I’m going to visit my partner in Japan this September, I’m currently a freelancer with 2 jobs (designer and online ESL tutor) but there are a few complications with my tax documents that I have to fix, so he offered me to be my guarantor for the trip. However I have another thing to ask. I got denied once when I applied for a single-entry visa 4 years ago. I was a careless 19 year-old, probably I wasn’t able to submit enough proof of return at that time :( I didn’t even submit my COIC and my university registration form. Anyway, I will be submitting a cover letter for my visa application this year but should I tell them that I got denied before? or makakaapekto ba yun sa application ko? whatchathink? Thank you, thank you! Hi Aikyu, no need to highlight that pa in your cover letter. Pero malamang alam naman nila yun. Baka makikita naman nila yun sa record nila. Pero sa cover letter, focus on this trip and your purpose this time around. HELLO! For a first-time applicant, is it okay to go for a multiple re-entry? Best if single muna kung first time. Hi Chelsea, either way ay okay naman. Hindi naman ganun kahigpit ang Japan kumpara sa ibang countries. Oks lang kahit first time mo to travel kung sufficient naman ung funds mo and employed naman. Ask ko lang kung kailan pwede ulit mag apply ng visa? Got mine last Feb 18, 2018 and expired last May 31 2018. May time frame po ba before you can re-apply? Thanks! Hi. What if may guarantor sa pinas, yung sa application form na may guarantor sa second page, di na ba fifill up-an yun pag dito sa pinas nakatira yung magiging guarantor? Not Applicable lang sya? Hi Chesca, the easiest way is to have a sponsor so you need to submit their financial documents instead. good day po..ask ko lng po kng ok lng na joint accnt ung bank cert na ipapasa ko tas may sponsor ako taga japan gf ng pinsan ko ok lng ba na gagawa din xa ng letter na sa knya ako tutuloy kc bday din ng anak nya..
Pero yes, oks lang naman ang joint account. And kailangan mo ng invitation letter, among others. My husband is working in japan as an ofw and I’m planning to apply for the visitor’s visa. Should the “Invitation letter from the person you will visit” requires it to be original? or pwede lang scanned copy of the original? As well as the ” Foreign Registration Certificate”. Hi Wylen. Naku, di ko po alam. Pag nagsusubmit po ako, original yung sinusubmit ko para sure na walang problem. Ina-ask ko na lang ung kakilala ko sa Japan na i-mail saken ang documents. Hi Ask ko lng po if possible po ito.. 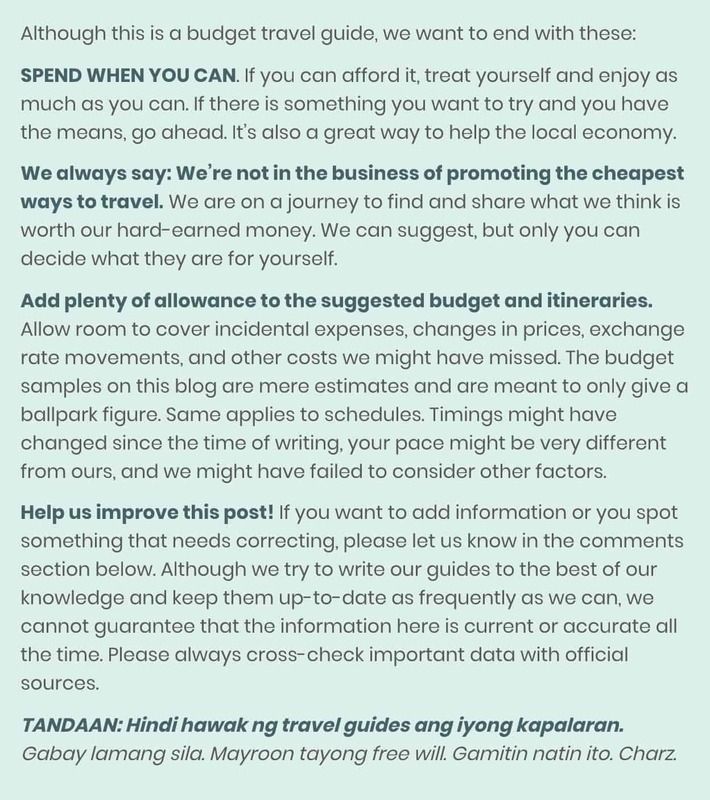 Example.. ung ginawa ko pong itinerary is for Tokyo/Osaka route only and naapprove ung visa..
what if ung nakalagay po sa itinerary is di ko po susundin like pupunta po ako sa ibang place like Chichibu ganun pero kaya naman ng budget ko.. magkaka issue po ba ako? or malalaman ba ng Japan un? I would like to ask for your opinion. I will be applying for Japan visa next week and i plan to use my flight itinerary as a supporting document. However, there are 2 other names in there which will not process a visa anymore because they have multiple entry visits since 2016. Do you think that will be a red mark for me? But to answer your question, I don’t think it will affect your application. That’s perfectly normal. Hi. I’m unemployed po and walang bank account. Yung boyfriend ko po ang sasagot ng expenses ko since may work naman siya. Parehas kaming nandito sa Pinas and sabay kaming magtatravel. Anong mga documents po ang kailangan naming ihanda? Hi! Will they accept BIR form 2307 or Certificate of Creditable Tax Withheld at Source? as a substitute for BIR form 2316 (ITR). Hi Ron-Ron, natry ko na sya once before, tinanggap naman. To be safe, gawa ka na lang ng explanation letter bakit wala kang 2316. Hi! I am unemployed without a bank account and a home maker of 3boys with a common law partner for 10 years already. My second degree cousin who has dual citizenship (US & Fil) is inviting me for a Japan trip Apr 2019. Since this is a sponsored trip, what supporting document should we provide as proof of our relationship? Also, when is the best time to apply for a visa? Hope to hear from.you. Thank you in advance! Hi, Sir! Pwede kaya gamitin ko payroll account ko for the bank cert? Hi. I just got back (just yesterday) from a one week trip from Osaka. And I wanna go back but this time I’ll visit Tokyo. How soon can I apply for a tourist visa? Is there a time gap / waiting time needed? Thanks! Not sure if there’s such a rule. But my teammate and I have tried applying again after less than a month and we didn’t have a problem. Approved pa rin. 1. Sa Okinawa po siya based pero sa Tokyo po kami magkikita so yung address na mailalagay ko is for a hotel and not sa home address niya. Magkakaproblem po kaya dun kung visit visa po ang aapplyan ko? 2. Hati po kami sa expenses ko sa Japan so parehas po kami magsusubmit ng bank certs, etc. Pwede naman po yun di ba or better po ba na siya yung sole guarantor ko and I will not submit anything? Naisip ko na rin sana mag-tourist visa na lang para less hassle kaso baka ma-question din po ako since estudyante pa po ako and no ITR kahit may savings naman ako. Kung maghanap din po kasi ako ng guarantor dito sa Pinas, malabo po eh. Hi Ann, pasensya na, pero di ko po alam pag ganyan situation. Kung nakapili ka na ng travel agency kung saan ka mag-aapply, best to call them na lang para sigurado. do you have an idea regarding a doctor applying for multiple visa? what are expectation regarding approval, requirements, etc, ? I think same lang naman pag doctors, as long as hindi military doctor. Thanks for this very informative post. I have been in Japan twice as an engineer and an Intra company transferee in my past visas. Do I have to submit a copy of my birth certificate for a temporary visitor visa this time? Hi.. Thanks for this informative post. I have a question. My parents was granted a single entry visa. 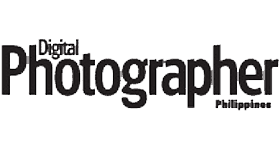 Valid from January 15- April 15. We booked a ticket to Japan April 8-April 13. And upon entering Japan, I would assume that the immigation officer will grant them 15 days stay in Japan. 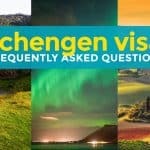 Will it be a problem knowing the visa will expire prior to the 15 days stay granted? Is the last day of the validity of visa would mean the last day to enter Japan or last day of stay in Japan? Thanks! Hi Carmen, no. They can still stay for 15 days provided that they enter Japan within the validity period. Hello, may japanese guarantor po ako. Pinadalhan nya ko ng docs, but na question po yung juminhyo kasi kulang details parang sa list of family members. Although sya lang naman talaga nakatira doon. Ang address naman lo ay tama. Sabi ng agency 50/50 lang daw po ang chance ko. Ganoon po va talaga? Hi, Your post is very helpful. I have a question though, I have a stepson who will is still a minor. He will turn 18 weeks before our flight. My dilemma is, he is still minor the time we will apply visa. Is okay, i’ll be listed as his guarantor? Do they need additional requirements for minor applicants? Thank you!!! When I applied for my minor niece, they didn’t ask for additional documents other than what’s listed above. Hi Yosh! Here I am once again hehehe. I’ve visited Japan last March 25 up to April 05, 2019 (big thanks to your blog huhu) and wanted to apply again for a multiple entry visa this year. However, my passport will expire on January 2022. Will that be a problem on my application? Hi. I need your help. Me and my sister are applying for a Japan Visa. My sister’s a student and i’m unemployed but i’m working for my mom so i earn naman monthly. My problem lang is that i don’t have an ITR. Would it be weird if we ask our mom to sponsor the both of us nalang since i can’t present an ITR. My bank only has 80-90k ish and we’re planning to stay in Japan ng 12 days. I’m a frequent traveller naman but i’m scared lang i might get denied since i won’t be able to present an ITR. If we ask our mom to sponsor our trip, do we need to explain pa why’s she gonna sponsor? Thank you! Hi Andre, it’s okay kasi immediate family naman ang sponsor (mom) and ung companion mo (sis). You will need a guarantee letter so pwede dun ma-explain bakit sya ang magsponsor pero madali lang yun kasi nga mom nyo naman sya.